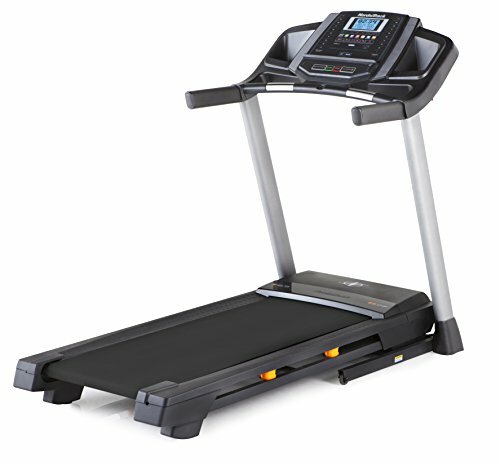 The T 6.5 S is one of the most inexpensive models currently offered by NordicTrack. Yet, for its simple price tag, the model offers a wide range of features such as its 20 preset training programs, a 2.6 CHP motor that is consistent enough to provide you a decent exercise experience. The Treadmill also includes other useful features such as its patented Space Saver design, EasyLift Assist Technology, as well as iFit compatibility and an option to play music by hooking it to the MP3. With all of the above features being offered in a quality treadmill for a decent price assures that the NordicTrack T 6.5 S Treadmill is a great machine to have. The T 6.5 S model has assembled dimensions measuring at 73” x 35.75” x 67.5” of length, width, and height respectively. The frame of the treadmill is foldable and built in wheels at the base of the treadmill makes it easier to transport it from one room to another. The EasyLift Assist Technology features hydraulic shocks that significantly increase the safety and convenience with which you can fold or unfold the treadmill as per your own whims. Based on the SpaceSave design, the NordicTrack T 6.5 S is a machine that won’t occupy needless space in your room and its folding option allows your room to remain spacey. A 55 inch long and 20 inch wide running belt affords you vital space to both run and jog, and thus inch ever closer to your fitness destiny. The running belt is equipped with FlexCushioning technology that absorbs your strides upon impact and allows your muscles, joints, and tendons to recover faster after you have completed your workout. A 5” inch LCD back display tracks necessary readings such as elapsed time, total speed, distance covered, heart rate, and total number of calories burned. Using your stats, iFit can customize your workouts just for you. The console features 20 preset workout programs that give you default modes that can vary or simplify the intensity of your workout. The good number of workout programs ensures that the NordicTrack T 6.5 S is worth the money and is guaranteed to provide you with diversity in your exercising preferences. Control keys as well as QuickSelect keys on the console make it easier to directly choose a certain work out mode. Best of all, if you have a subscription to iFit then you can download even more tailor made workout programs directly from the application by integrating your treadmill to it. The NordicTrack T 6.5 S outdoes itself when it comes to music compatibility, with two speakers and the capacity for MP3/iPod compatibility gives you the luxury to connect your phone or ipod to the treadmill and workout while enjoying your favourite music. CardioGrip heart rate sensors on the handrails measure the reading of your pulse and relay the reading to the display. The treadmill can go to speeds as high as 10 MPH, it also features incline for up to 10%. Both the speed and incline can be adjusted from the incremental control buttons on the console or if you want a direct workout program, just choose a quickselect mode and let the treadmill do the rest. And of course, a safety clip can be attached to your clothes which will power off the treadmill every time the clip gets detached. With all things considered, however, there is a slight catch as the T 6.5S model does not come with a cooling fan or the cup holders which would otherwise make the treadmill a lot more convenient to operate. The NordicTrack T 6.5 S Treadmill features a 2.6 Continuous HP motor that gives a necessary thrust aimed to run the belt smoothly and consistently for your ease. Due to its operation however, the motor has a tendency to be noisy at times so make sure you’re sensible to the fact that others around you might get disturbed by the whirring of the motor. One of the treadmill’s grandest feature is its Flex Select Cushioning Deck that allows you to increase or decrease the tension in the belt with the turn of a knob. You can easily choose between making the deck firm as if on a road, or soft and malleable enough to absorb your strides and ensure your muscles recover faster after your workout. FlexSelect Cushioning allows you to adjust tension of running belt. 20 Workout Programs add a lot of diversity to your options. The motor has the tendency to be noisy. The lack of features on the console such as missing cup holder and cooling fan are a downside. The incline of 10% and 10 MPH max speed does not challenge the user enough. For what it’s worth, the NordicTrack T 6.5 S is a very admirable treadmill since it is generous with its plethora of features that aim to personalize fitness as an integral part of your life for you. 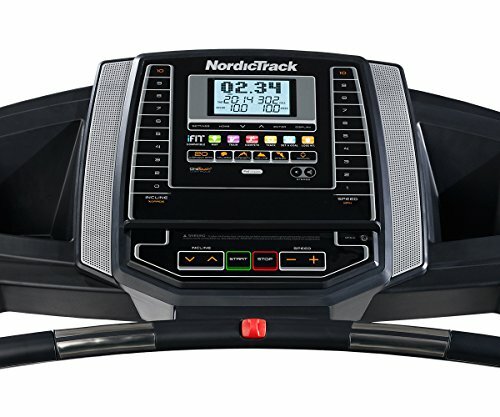 It may have its fair share of flaws but owing to its friendly price tag, the transgressions are warranted since not many treadmills offer the brand’s security, as well as absolute reliability the way NordicTrack does. Sure, it may inevitably be more suited as a walker’s treadmill at the end of the day but the T 6.5 S model still manages to impress. A reliable member of the NordicTrack treadmill family that offers decent features and the pleasures of music compatibility to keep you engaged.